Amazon Fire TV Stick 4K review | What Hi-Fi? Amazon has (in the UK at least) streamlined its video streamer selection to just two sticks: the existing Fire TV Stick and this, the new Fire TV Stick 4K (£50/$50). The big upgrade is support for 4K video, of course, but it’s far from the only improvement: HDR has also been added, not just in standard HDR10 form, but also HLG, HDR10+ and Dolby Vision, making this the most format-friendly high dynamic range video streamer currently available. Alexa has been added, too, and proves more compelling than you might imagine. All of that makes it worth much more than the £10 premium the Fire TV Stick 4K commands over its sibling. But what’s perhaps more surprising is what a star performer it is for a video streamer. Such is its chunkiness, the Amazon Fire TV Stick 4K might be more accurately referred to as a branch. 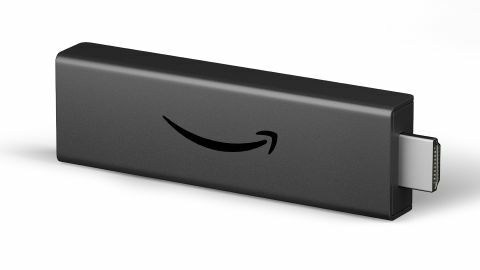 Compared to a more traditionally shaped streamer such as the Apple TV, this is a far more compact design, but at 10cm long the Fire TV Stick 4K will protrude from the edge of many TVs when plugged into a sideways-facing socket. Plugging it in next to other cables can be a real squeeze too. There is, at least, an HDMI extender in the box that can help with the latter issue as well as improving the wi-fi performance – although we had no issues either way. You can also hardwire the Stick to your router by adding the optional ethernet adapter. As well as being physically bigger than most sticks, the Fire TV Stick 4K also draws more power, to the extent that you should use the USB wall plug that comes in the box rather than running the cable into one of your TV’s own sockets – though we tried it both ways during testing and spotted no difference in performance. But wall-mounters who’ve chosen a stick device for neatness will be disappointed if they discover plugging the Amazon into the wall is essential. First-time set-up is pleasantly slick. The Stick automatically installs any available software updates, quickly and easily connects to your wi-fi and, predictably, links to your Amazon account. The video that introduces you to your new device is useful, but sets off any Alexa device already in the room. Once the initial set-up is complete there are still a few more advanced options worth exploring. The option to play all content in its native frame rate is turned off by default and we’d strongly recommend turning it on. The Fire TV Stick 4K is also by default set to always output HDR, effectively upconverting standard dynamic range content to rather inauthentic effect - we’d recommend you also change that while in the setting menus. If your experience of Amazon on TV is limited to the Prime Video app built into your television, you’ll be pleasantly surprised to discover that the presentation and user experience offered by the Fire TV Stick 4K is vastly superior. Home screens are bright, colourful, and feature prominent artwork advertising Amazon’s latest content, menus are bold, sharp and clear, and operation throughout is snappy and smooth. And while the Prime Video app has become a nightmare when it comes to finding Ultra HD content, it’s given a little more prominence here and is actually presented in search results. Hallelujah! Adding a further dimension to operability is Alexa voice control. Simply press the voice control button on the remote and issue commands into the integrated microphone. What makes the Fire TV Stick 4K’s voice control special is its combination of responsiveness, consistency of comprehension and scope. Issuing commands feels natural, they’re always understood and enacted upon quickly, and you can do more than simply search for a show or pause what you’re watching. With HDMI-CEC correctly setup, you can issue a single voice command to turn on your TV, turn on the Fire TV Stick 4K and start playing an episode of, say, Jack Ryan. Now that’s neat. If you’ve got another Alexa device, such as an Echo Dot, you can issue the command ‘out loud’ – no need to even find the Stick’s remote. However, Alexa is slightly hampered by a patchy general search function. It’s not universal, for a start, so iPlayer, for example, isn’t included in results. And although Netflix is included, Amazon results are predictably prioritised – even if clicking on them would result in paying to watch something that’s already included in your Netflix subscription. In short, the search function, whether activated by type or voice, works best when you know what you’re after. At front and centre of the app selection is Amazon Prime Video, here available in 4K with standard HDR, HDR10+ and Dolby Vision – and with Dolby Atmos sound. Netflix is here, too, also in 4K with HDR and Dolby Vision – although without HDR10+ (which isn’t currently supported by Netflix) or Dolby Atmos (which you will get from the Netflix app on some platforms, such as Apple TV). As well as BBC iPlayer you also get ITV Hub, 4OD and Demand 5, while for local streaming there’s Plex and VLC, and for music you get Spotify, Deezer and Tidal. Now TV would be nice, but the Fire TV Stick 4K has all other bases covered. That’s key to its appeal: it includes all of the streaming services you’re likely to want and supports all of the current most advanced video and sound formats. The support for HDR10+ is, in fact, a one-up on the Apple TV 4K, which costs £130 more than this. The Apple TV does counter, though, with a far superior selection of pay-as-you-go blockbusters in 4K HDR. Amazon allows you to rent and buy new releases that aren’t included with Prime, but few are in 4K and fewer still in HDR. Playing The Grand Tour shows off Amazon’s production qualities at their highest, and looks excellent when played through the Fire TV Stick 4K. This is a really sharp and detailed image, possibly to the detriment of the increasingly saggy presenters, but to the benefit of the four-wheeled beauties on show. It’s terrifically bright and vibrant, too, making the image of a Ford GT rumbling through the streets of New York all the more stunning. There’s a bit of judder to tricky motion, more in terms of people than cars, and some of the brightest detail is missing, but this is a really impressive picture that far surpasses the prevailing stick standard. Switching to Marco Polo on Netflix continues the fine form, with impressive nuance as well as dramatic contrast. There’s a bit of detail missing at the darkest and brightest ends of the spectrum, but blacks are deep and dramatic while whites are punchy and pure - the result is a dynamic, engaging picture. You won’t be watching 4K HDR all of the time, of course, and Informer on BBC iPlayer proves that the Fire TV Stick 4K is a dab hand when it comes to standard 1080p, too. Detailed and clear, and with subtle, balanced colours, there’s nothing here to complain about, particularly given the price. Dolby Atmos is practically unheard of at this end of the market, so we make a beeline for Amazon’s Jack Ryan and are delighted to discover not only that it works, but that it also sounds really good. This is room-filling sound with excellent placement of effects and real weight and drama. The Fire TV Stick 4K sounds good with standard 5.1 and even stereo, too. This is a clear, fairly detailed and spacious sound regardless of the format, and will reward those using a decent sound solution rather than the speakers built into their telly. Having said that, next to the very best streamers (essentially the Apple TV 4K) or a dedicated disc-spinner, the Stick is slightly lacking in terms of dynamics and outright punch, which can rob an action set piece of a little of its impact. For a device this size and price, though, the Fire TV Stick 4K is undeniably impressive. If you’re going to buy a dedicated video streamer, you want it to do everything – and until now the only one that did that was the Apple TV 4K. But for just £50, the Amazon Fire TV Stick 4K has all the apps you need, supports all current HDR formats and throws in Dolby Atmos. That’s an astonishingly good deal, particularly when you factor in the all-round quality of the performance and excellent user-friendliness. The Apple TV 4K is still the very best streamer – it has the edge in terms of picture and sound quality and, perhaps more importantly, gives you access to a better-stocked selection of 4K HDR films. But the fact that you would have to spend £180 to better the Fire TV Stick 4K proves just what an exceptional bargain it is.